There is something deeply satisfying in the sound of quarters plunking one-by-one into an old arcade cabinet. It’s a solid, assertive sound that lets you know exactly where you stand. You only have so many lives, so many tries, to grab that joystick, mash those big plastic buttons, and win glory for a spot on the high score list. FIST FULL OF QUARTERS: Arcades are few and far between, but if you take the time to look, classic games are right under your nose. That was an experience I’d been searching for when I walked into the dark and cavernous HotShots Billiards and Family Entertainment poolhall in Pismo Beach. While the rows of pool tables dominate the joint, I wasn’t there to embarrass myself in front of pool-savvy tourists and HotShots regular sharks. Instead, I was hoping to put in some serious time with old-school arcade games. I came of age as the video game arcade was in its final, waning years. I was born too late to see their heyday in the 1980s, when large rooms full of Pac-Man and Joust cabinets were a social gathering place for sugared-up kids with money to burn. By the time I came along, the original Nintendo console was a common sight in most households and would eventually sound the death knell of the local arcade. Still, I had a few good years of blowing allowance money on Street Fighter II, NBA Jam, or (much to the chagrin of our parents) Mortal Kombat in arcades at the local mall and mini-golf courses. Before most of them went out of business, I’d spent enough time in arcades to get a taste for whiling away the hours in them, setting the stage for occasional attacks of seeking them out for purely nostalgic reasons as an adult. BUTTON MASHING : No need for fancy controllers or VR headsets when you’re on a retro-gaming rampage. HotShots has a few arcade machines. 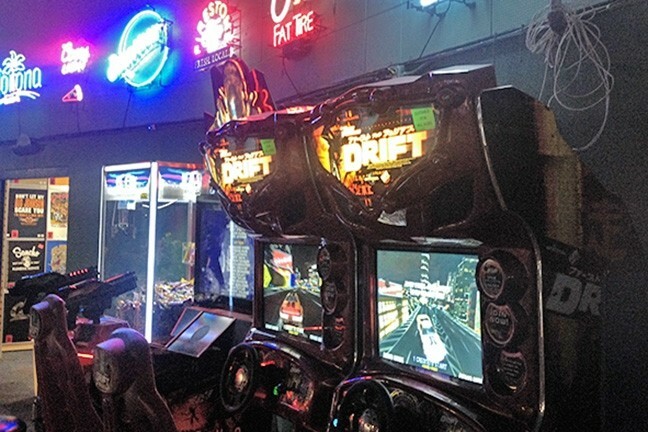 The newer ones are near the entrance and included a light-gun style shooter based on the Alien film series, and a racing game modeled after the Fast and Furious film series. They looked fun, but I was on a mission, and that mission took me past the large, fancy-looking cabinets, to a neglected corner near the bar. There, shoved side by side and nearly out of sight, was exactly what I was looking for. Two retro table-style cabinets jam-packed with classic arcade games. 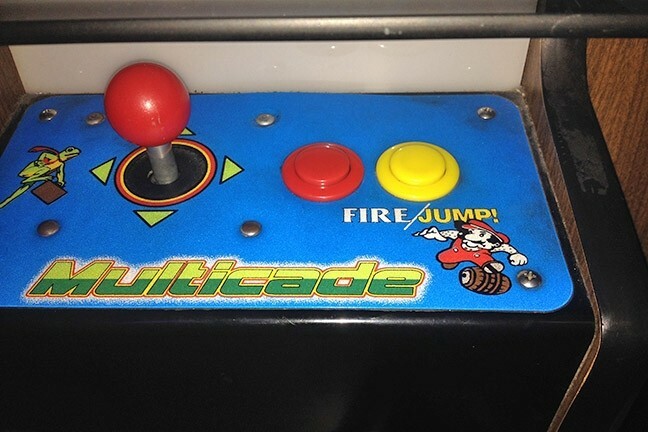 Called “multicades,” these machines offered a selection of nearly every popular game from the early years of arcades. 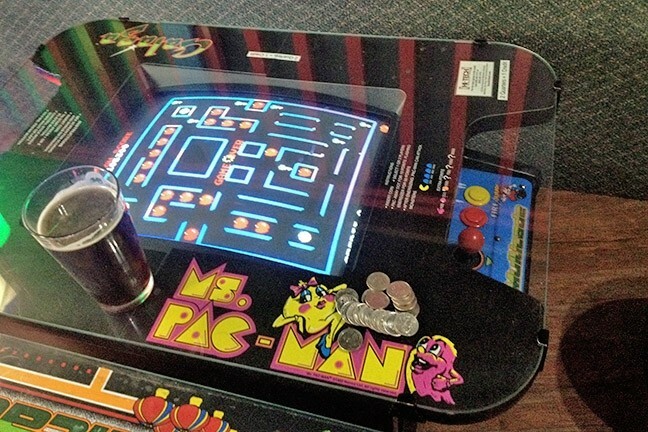 Pac-Man, Ms. Pac-Man, Galaga, Burger Time, Donkey Kong, and more, all in a single cabinet. As I pulled up a seat and scattered my roll of quarters on the flat glass of the machine, I heard the familiar theme to Space Invaders chirp to life. My fingers twitched. There were a lot of games to choose from, so I warmed up on a classic Missile Command, then moved on to Ms. Pac Man, Zaxxon, and Sinistar in quick succession. I was never an ace at arcade games by any means, but I could tell the years had taken their toll on me. I was bleeding quarters like nobody’s business, I felt less like a kid on a roll in an old arcade and more like a sad loser watching his fortune drain away on slot machines in Las Vegas. What was wrong with me? I switched over to a game I knew I was a little better at, Super Mario Brothers, to build my shattered confidence back up. I felt like I was getting my groove back and from there it was on to Centipede, and then Donkey Kong Jr. By the time my quarters ran out, I’d played almost every game on the cabinets, but my best showing was so far down the “high score” screen I didn’t even bother counting. I realized I couldn’t have been happier. EXTRA LIFE: With old-style arcades going the way of soda fountains, hunting down classic gaming cabinets is part of the fun. That’s part of beauty about these old games. Modern video games have become a multi-million-dollar industry primarily aimed at an adult audience. They have huge budgets, and deliver hours of gameplay with hyper-realistic graphics. There’s something to be said to come back to the basics, to take on these deceptively simple-looking games that take just a few minutes to learn but years to master. They are more than simply reminders of video game history. But it’s not just the games that make up the lost arcade experience. A big part of it is the search. The sense that these games you want to play aren’t at your fingertips, and you must seek them. The sense of discovery and adventure. The anticipation that what you are looking for is waiting for you to find it, hidden away in in some dusty and forgotten corner. Staff Writer Chris McGuinness forgot how freaking hard Galaga is. He can be reached at cmcguinness@newtimesslo.com, or on Twitter at @CWMcGuinness.